Bridge pins can significantly affect the sound of your acoustic guitar. Most acoustic guitars come with standard pins that perform well enough, but upgrading the pins is a must for all of us who want a better tone. In my opinion, you should consider getting a new set of pins even if the old ones are okay. The bridge pin upgrade is easy and inexpensive, and the increased clarity and volume is definitely worth it. Bridge pins are made of different materials that can affect their price and performance. To help you get the perfect set, we’ve reviewed the best bridge pins you can currently find for your acoustic guitar. How Do Pins and Plates Work? The ebony bridge pins from Blisstime are completely handmade. The high-quality ebony is embellished with an abalone dot inside a brass circle atop each pin. But that’s not the reason I have such high regards for these pins. The ebony wood is dense and sturdy to deliver excellent vibration transfer from the guitar bridge. These Blisstime bridge pins are designed to provide optimal sound clarity and intonation. You cannot go wrong with ebony pins because they are less susceptible to wear and tear than some other options. The Blisstime ebony bridge pins are made to perfectly fit Taylor and Martin guitars, but you shouldn’t have any problems fitting them on other guitars. If we consider built quality, durability, and design, these are truly great. 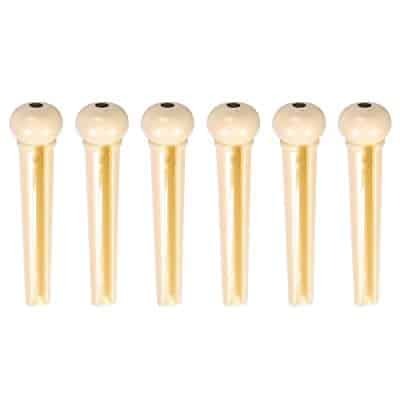 Simtyso offers two sets of 6 acoustic guitar bridge pins at a price that is affordable for any aspiring guitarist. These pins are made of high-quality ABS plastic that has been precision molded for a universal fit. The pins have an ebony finish with a single grey dot on top. If you are a hobbyist guitarist looking for a simple upgrade from the standard pins, this set is a great option. These pins are quite easy to use and install even for novice guitarists. You’ll hear an improvement with most affordable guitars. If you are looking for pins that can improve the harmonics of your instrument, this GraphTech set might be the one. These pins are precision engineered for consistent quality and enhanced tonal output. After you install the GraphTech set, you may expect a crisper high end and richer and more open low end. But that’s not all. The pins can give your acoustic guitar some additional character. To be more precise, let’s imagine the harmonic difference between a twelve and four-piece choir. This is the kind of additional character the GraphTech pins can provide. These pins are well made, easy to install, and a definite improvement over a standard set of pins. The Blue Handcart bridge pins are made of durable ABS plastic and precision molded for consistent quality. 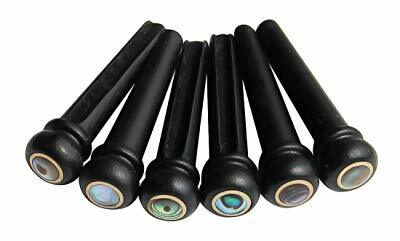 In addition, the pins are among the strongest plastic pins and they are tensile enough to provide excellent vibration transfer. At the same time, these Blue Handcart bridge pins look really good and they come in two color combinations. You can choose the ivory pins with black dots or the black pins with white dots. These acoustic guitar pins are 5mm wide and 32 mm long so they should fit most guitars. This Luvay set arguably offers the best value for money. You get six bridge pins, a bridge saddle, and a nut. Each piece in the package is made entirely of hand-picked cow bone and meticulously crafted into excellent guitar accessories. 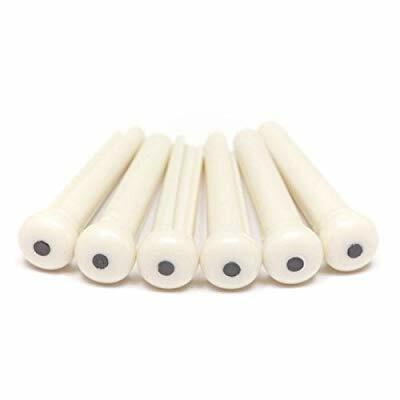 Natural bone pins and saddles are desirable for all who wish to improve the performance of a standard acoustic guitar. Bone is not as porous as some other materials, and many professionals and luthiers agree that it provides good clarity and nice intonation. Overall, my recommendation would definitely be to give this Luvay package a try as the pins are affordable and well-built and they provide a noticeable tonal improvement. In essence, bridge pins are there to support the strings against the bridge plate and bridge on a guitar. They are available in various shapes and sizes and materials, which we will cover in the next section. It is worth noting that bridge pins are designed to hold the strings rather than secure them. Although some novice guitarists might believe otherwise, the pins only hold the ball at the end of each string. The pin can launch from the bridge if it isn’t properly positioned against the bridge plate. This is why it is advisable to seek professional help if you are not sure how to change the pins by yourself. Guitar bridge pins are usually made of plastic, wood, ivory, or bone, but there are also brass pins. Each material has its unique pros and cons. Plastic pins, for example, are cheap but they usually don’t last long or improve the tone. According to my research and experience, wood pins are also easy to get one’s hands on, but some can be expensive. I can honestly say that these pins provide a noticeable improvement in the tone of the guitar. On the other hand, genuine ivory pins give a pleasing warm tone but they are hard to find these days due to legal and ethical reasons. Bone bridge pins are not that hard to find and they offer an increased sustain, but some of them can be expensive. A set of brass pins will last for a long time and they provide a clear bright tone which is great for some guitars that have too much bass. Changing guitar pins is not that difficult, but wood, brass, and bone pins might need some fitting to properly install them. 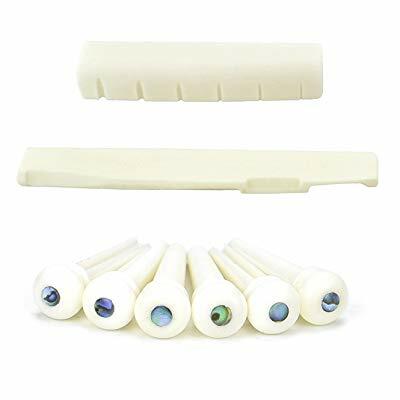 There is a set of pins for every guitarist and my selection of the best acoustic guitar bridge pins features various options that can fit most needs. These pins vary in price, material, and overall performance. After all is said and done, my personal favorite would be bone or wood pins. These pins can do wonders for the guitar tone and they are not that expensive, to begin with. Before a pin upgrade, you should know a thing or two about this guitar accessory. I hope you find my advice useful to choose the the right set of bridge pins for your acoustic guitar. I have read that mixing ebony pins on the 3 bass strings and bone on the 3 higher strings improves overall sustain on a Martin . Have you experienced this ,I just ordered walrus jaw bone to mix with Martin ebony on my Classic D Mahogany . Hope it’s worth testing . Hi Joe, I don’t have any experience with this, unfortunately. I hope it performs well for you! Great advice. Going to try some new pins.